Singers from all sections are welcome to audition. There are usually vacancies in every section at the start of every season. Vacancies can occur throughout the season, as well. Sometimes it is useful to have an audition, even if there is not enough room. When vacancies occur, we will consult our waiting list. SCC singers come from all walks of life. Everyone is expected to have had choral experience in an advanced ensemble. Formal voice study is not required, but all members are expected to be able to sing musically, on pitch, in accurate rhythm, and to have moderate to good sight reading ability. Singers are expected to have a good reading knowledge of musical notation, and some familiarity with foreign languages. • Come prepared to sing one short solo pieces of your choosing (art song, aria, hymn, or folk song) — in any language. An accompanist can be provided if needed, depending on the date of your appointment. You are welcome to bring your own accompanist, if you wish. • We will send you two short choral pieces which you will need to prepare to sing unaccompanied. • Your audition will begin with an extended warm-up to display the range and qualities of your singing voice. • You will be quizzed on intervals, articulation, and pitch retention. • You will be asked to read a passage in French, German, Italian, and Spanish. How many singers make up the Seattle Choral Company? The Seattle Choral Company has approximately 50 singers on its roster during the concert season. 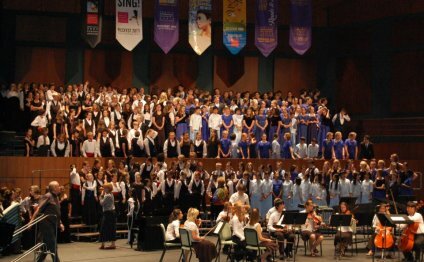 We expand to 75 singers for larger masterworks, when we are called upon to sing with regional orchestras. Our chamber choir, Cappella, consists of 24 to 32 singers. When and where are the rehearsals? The Seattle Choral Company rehearses on Tuesday evenings. Our rehearsals are generally scheduled from 6:45pm (sharp) to 9:30pm. We meet in the basement Social Hall of University Christian Church, located in Seattle’s University District. Our address is 4759 15th Ave NE (at the corner of 15th Ave NE and NE 50th St). In some locations, on-street parking is FREE. There is parking lot across the street from the church entrance which has a small evening parking fee.